It is hard nowadays to picture to one’s self what a pleasure-trip of students and grisettes to the country was like, forty-five years ago. But Victor Hugo will do his best to picture it for us. The suburbs of Paris are no longer the same; the physiognomy of what may be called circumparisian life has changed completely in the last half-century; where there was the cuckoo, there is the railway car; where there was a tender-boat, there is now the steamboat; people speak of Fecamp nowadays as they spoke of Saint-Cloud in those days. The Paris of 1862 is a city which has France for its outskirts. Hugo writes to inscribe Paris in the memory, to immortalize it as it was, to make sure that generations never forget. This has an immense weight to it, a ponderous feeling as though an ancient uncle were pressing your hand and whispering truths about things you will never see but he expects you to hold dear. In this case, the setting of the Gorbeau house, where Jean Valjean flees with Cosette. The barrier was close at hand. In 1823 the city wall was still in existence. This barrier itself evoked gloomy fancies in the mind. It was the road to Bicêtre. It was through it that, under the Empire and the Restoration, prisoners condemned to death re-entered Paris on the day of their execution. It was there, that, about 1829, was committed that mysterious assassination, called “The assassination of the Fontainebleau barrier,” … Take a few steps, and you come upon that fatal Rue Croulebarbe, where Ulbach stabbed the goat-girl of Ivry to the sound of thunder, as in the melodramas. A few paces more, and you arrive at the abominable pollarded elms of the Barrière Saint-Jacques, that expedient of the philanthropist to conceal the scaffold, that miserable and shameful Place de Grève of a shop-keeping and bourgeois society, which recoiled before the death penalty, neither daring to abolish it with grandeur, nor to uphold it with authority. Bourgeois houses only began to spring up there twenty-five years later. The place was unpleasant. In addition to the gloomy thoughts which assailed one there, one was conscious of being between the Salpêtrière, a glimpse of whose dome could be seen, and Bicêtre, whose outskirts one was fairly touching; that is to say, between the madness of women and the madness of men. As far as the eye could see, one could perceive nothing but the abattoirs, the city wall, and the fronts of a few factories, resembling barracks or monasteries; everywhere about stood hovels, rubbish, ancient walls blackened like cerecloths, new white walls like winding-sheets; everywhere parallel rows of trees, buildings erected on a line, flat constructions, long, cold rows, and the melancholy sadness of right angles. Not an unevenness of the ground, not a caprice in the architecture, not a fold. The ensemble was glacial, regular, hideous. Nothing oppresses the heart like symmetry. It is because symmetry is ennui, and ennui is at the very foundation of grief. Despair yawns. Something more terrible than a hell where one suffers may be imagined, and that is a hell where one is bored. If such a hell existed, that bit of the Boulevard de l’Hôpital might have formed the entrance to it. Nevertheless, at nightfall, at the moment when the daylight is vanishing, especially in winter, at the hour when the twilight breeze tears from the elms their last russet leaves, when the darkness is deep and starless, or when the moon and the wind are making openings in the clouds and losing themselves in the shadows, this boulevard suddenly becomes frightful. Only suddenly. Only at night. The author of this book, who regrets the necessity of mentioning himself, has been absent from Paris for many years. Paris has been transformed since he quitted it. A new city has arisen, which is, after a fashion, unknown to him. There is no need for him to say that he loves Paris: Paris is his mind’s natal city. In consequence of demolitions and reconstructions, the Paris of his youth, that Paris which he bore away religiously in his memory, is now a Paris of days gone by. He must be permitted to speak of that Paris as though it still existed. It is possible that when the author conducts his readers to a spot and says, “In such a street there stands such and such a house,” neither street nor house will any longer exist in that locality. Readers may verify the facts if they care to take the trouble. For his own part, he is unacquainted with the new Paris, and he writes with the old Paris before his eyes in an illusion which is precious to him. It is a delight to him to dream that there still lingers behind him something of that which he beheld when he was in his own country, and that all has not vanished. So long as you go and come in your native land, you imagine that those streets are a matter of indifference to you; that those windows, those roofs, and those doors are nothing to you; that those walls are strangers to you; that those trees are merely the first encountered haphazard; that those houses, which you do not enter, are useless to you; that the pavements which you tread are merely stones. Later on, when you are no longer there, you perceive that the streets are dear to you; that you miss those roofs, those doors; and that those walls are necessary to you, those trees are well beloved by you; that you entered those houses which you never entered, every day, and that you have left a part of your heart, of your blood, of your soul, in those pavements. All those places which you no longer behold, which you may never behold again, perchance, and whose memory you have cherished, take on a melancholy charm, recur to your mind with the melancholy of an apparition, make the holy land visible to you, and are, so to speak, the very form of France, and you love them; and you call them up as they are, as they were, and you persist in this, and you will submit to no change: for you are attached to the figure of your fatherland as to the face of your mother. Every flight should be an imperceptible slipping away. While he was growing up in this fashion, the colonel slipped away every two or three months, came to Paris on the sly, like a criminal breaking his ban, and went and posted himself at Saint-Sulpice, at the hour when Aunt Gillenormand led Marius to the mass. There, trembling lest the aunt should turn round, concealed behind a pillar, motionless, not daring to breathe, he gazed at his child. The scarred veteran was afraid of that old spinster. The Faubourg Saint-Antoine had also other causes to tremble; for it received the counter-shock of commercial crises, of failures, strikes, slack seasons, all inherent to great political disturbances. In times of revolution misery is both cause and effect. The blow which it deals rebounds upon it. This population full of proud virtue, capable to the highest degree of latent heat, always ready to fly to arms, prompt to explode, irritated, deep, undermined, seemed to be only awaiting the fall of a spark. Whenever certain sparks float on the horizon chased by the wind of events, it is impossible not to think of the Faubourg Saint-Antoine and of the formidable chance which has placed at the very gates of Paris that powder-house of suffering and ideas. The New Building, which was the most cracked and decrepit thing to be seen anywhere in the world, was the weak point in the prison. The walls were eaten by saltpetre to such an extent that the authorities had been obliged to line the vaults of the dormitories with a sheathing of wood, because stones were in the habit of becoming detached and falling on the prisoners in their beds. In spite of this antiquity, the authorities committed the error of confining in the New Building the most troublesome prisoners, of placing there “the hard cases,” as they say in prison parlance. The New Building contained four dormitories, one above the other, and a top story which was called the Bel-Air (Fine-Air). A large chimney-flue, probably from some ancient kitchen of the Dukes de la Force, started from the groundfloor, traversed all four stories, cut the dormitories, where it figured as a flattened pillar, into two portions, and finally pierced the roof. Otherwise the riot was conducted after the most scientific military tactics. 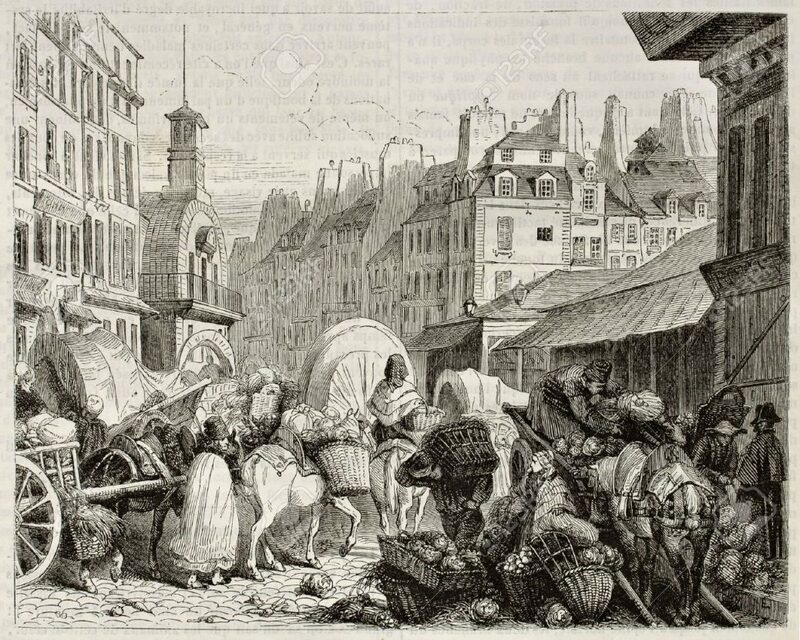 The narrow, uneven, sinuous streets, full of angles and turns, were admirably chosen; the neighborhood of the Halles, in particular, a network of streets more intricate than a forest. 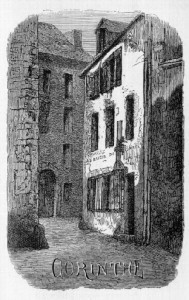 All that old quarter of the Halles, which is like a city within a city, through which run the Rues Saint-Denis and Saint-Martin, where a thousand lanes cross, and of which the insurgents had made their redoubt and their stronghold, would have appeared to him like a dark and enormous cavity hollowed out in the centre of Paris. There the glance fell into an abyss. Thanks to the broken lanterns, thanks to the closed windows, there all radiance, all life, all sound, all movement ceased. The invisible police of the insurrection were on the watch everywhere, and maintained order, that is to say, night. have no suspicion of the terrible scenes which this very spot witnessed hardly thirty years ago. It was there that lay the Rue de la Chanvrerie, which ancient deeds spell Chanverrerie, and the celebrated public-house called Corinthe. It is quite a Public House. And it is no more, this is all we have of it. The Mondétour labyrinth was disembowelled and widely opened in 1847, and probably no longer exists at the present moment. The Rue de la Chanvrerie and Corinthe have disappeared beneath the pavement of the Rue Rambuteau. As we have already said, Corinthe was the meeting-place if not the rallying-point, of Courfeyrac and his friends. Everyone in the house was asleep. People go to bed betimes in the Marais, especially on days when there is a revolt. This good, old quarter, terrified at the Revolution, takes refuge in slumber, as children, when they hear the Bugaboo coming, hide their heads hastily under their coverlet. There are soothing spots which act in some sort mechanically on the mind. An obscure street, peaceable inhabitants. 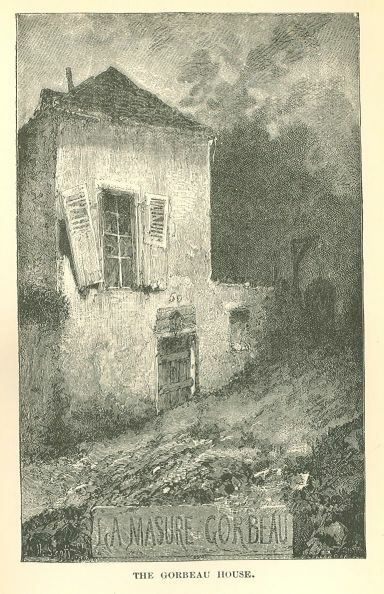 Jean Valjean experienced an indescribable contagion of tranquillity in that alley of ancient Paris, which is so narrow that it is barred against carriages by a transverse beam placed on two posts, which is deaf and dumb in the midst of the clamorous city, dimly lighted at mid-day, and is, so to speak, incapable of emotions between two rows of lofty houses centuries old, which hold their peace like ancients as they are. There was a touch of stagnant oblivion in that street. Jean Valjean drew his breath once more there. How could he be found there?